The Kelly Kettle Trekker is a portable sized biomass stove with a unique design. The stove consists of a fire pan and a chimney that is the water pot. The chimney is double walled and holds water between the walls. 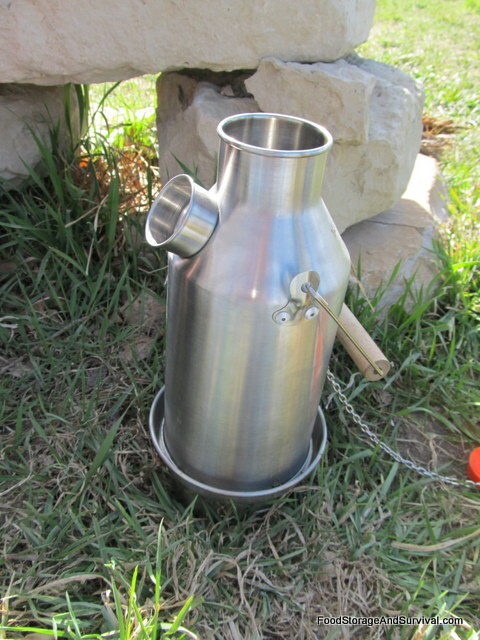 Kelly Kettle makes three different sizes of stove–the largest called the Volcano or Base Camp, a middle sized stove called the Scout, and the smallest, the Trekker. Each of these is available in aluminum or stainless steel. I got to test out the stainless steel Trekker over the last couple of weeks. For the short version of the review and to see it in action, check out my video below. For even more details, read on. If the video does not load for you, you can access it here. 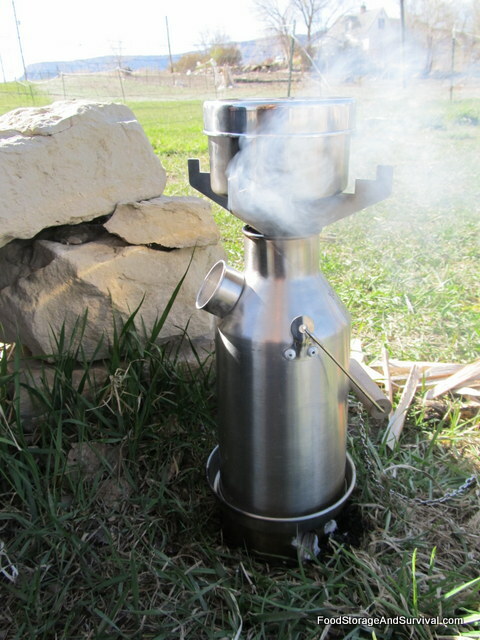 The Kelly Kettle Trekker is a biomass stove, which means you don’t have to carry a specific fuel for it because it burns anything that will burn–sticks, pine cones, bark, etc. The fact that it is a biomass stove is a huge plus in the long term usefulness of the stove. 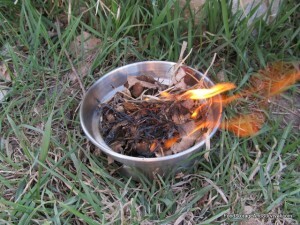 There will probably always be something you can make a fire with no matter how long your disaster scenario lasts. 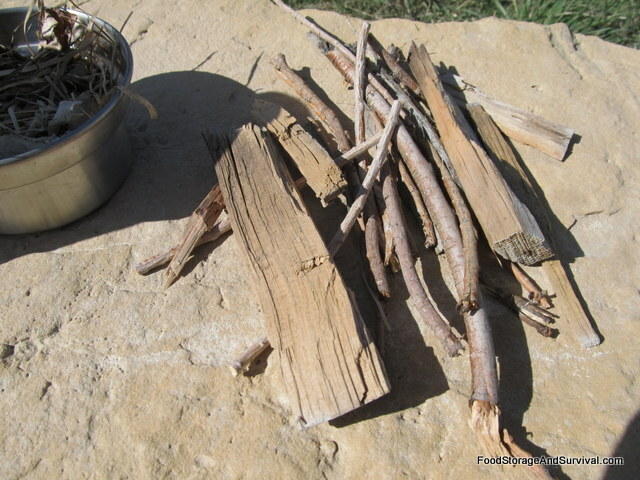 And for a biomass stove designed to be portable, this one can handle larger sticks than most others, meaning you won’t need to be feeding it quite as often as you might need to feed one that has a smaller burning chamber. 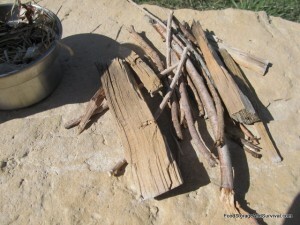 Sticks to burn–this stove can use longer sticks than many other portable biomass stoves because of the height of the burning chamber. It also boiled the water super quickly. I am at approximately 6000 feet elevation and this stove boiled water in 3 1/2 minutes. I was really surprised the first time I used it because it was boiling before I felt like I even had a decent fire going. The Trekker holds about 2 cups of water, so it is enough to cook for one or two people pretty easily. When we used it to cook water for the family, we just kept refilling the kettle and setting it back on the base. Sweet husband says we’ll be buying the larger kettle–he really likes this one. First, fill the kettle with water and find some fuel to burn. You always want water in your kettle while it is on the fire so it doesn’t overheat the metal. Then build a little fire in the fire pan. It doesn’t have to be too big. Aim the holes of the pan where you want according to the wind and how fast you want your fire to burn–into the wind for fast and hot, away from the wind for slower burn. Once your fire is started, place the kettle on the fire pan. Do not put the stopper in the hole! Just let it hang out beside the kettle. 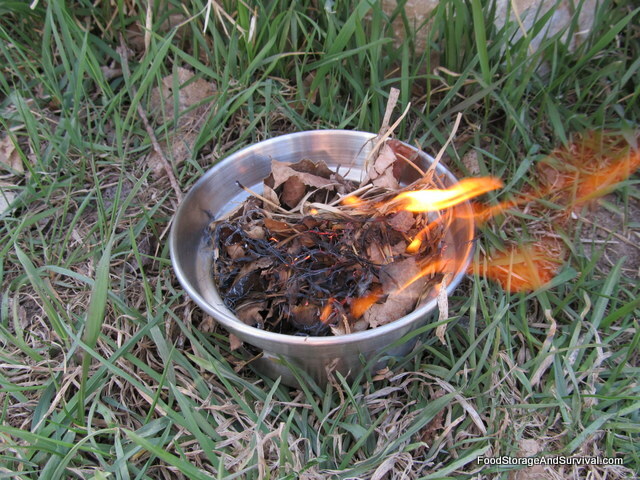 Feed some sticks in the top of the kettle and let them burn. While the kettle is heating the water, you can use the optional pot supports to heat something else on top of the kettle, which is really handy. The optional accessory kit also includes a small pot, pan, handle, and grates to cook over the coals of the fire pan after the kettle has been removed. Remove the kettle from the fire with the handle at a 90 degree angle to the kettle side to avoid burning yourself in the heat coming through the chimney. Use the handle and the stopper chain to pour the water from the kettle. The Kelly Kettle comes with a drawstring bag to hold all the parts together. At about 4 inches in diameter and 12 inches tall, and weighing approximately 1.7 lbs, it is small enough to be included in your emergency kit, although it is not the smallest stove you could carry. Many preparedness retailers carry the Kelly Kettles. You can also purchase them directly from Kelly Kettle USA or on Amazon. I really like this stove. 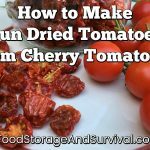 It was so easy to use and I didn’t have to be constantly feeding it sticks to produce a decent amount of heat and get my water boiled. The only drawback is the fact that you need to have water in the pot if it is on the fire pan, so if you want to cook something without heating water, you’ll be heating water anyway. Overall this is a fantastic little stove. I’m with hubby on this one–we’ll be getting the larger version.